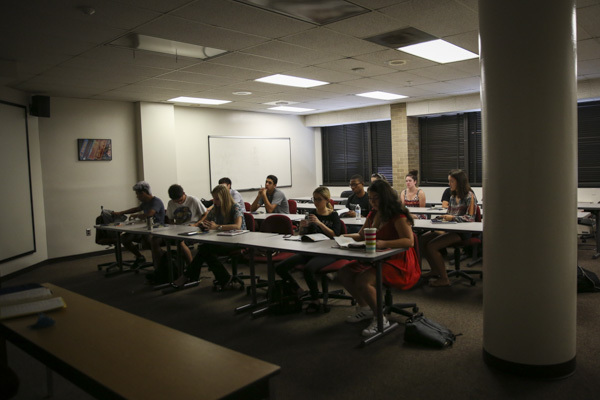 Students in an introductory Spanish class sit in a room their instructor found empty. Some language professors do not have classrooms to teach their courses. Some faculty members have been struggling to find places to teach their language courses — some even wandering buildings to claim empty classrooms. At least three instructors in the department of Romance, German and Slavic languages and literatures do not have rooms to teach their classes, and others have been placed in rooms that do not have the necessary technology to follow the curricula, the chair of the department Richard Robin said. Faculty have been unable to effectively teach their courses, and students are missing out on valuable class time. Robin said language classes generally need “smart rooms,” or rooms with multimedia technology — nearly all of the language textbooks are electronic. But language classes assigned to these rooms that were labeled as smart rooms are actually lacking the technology, Robin said. And other language classes have been moved out of smart rooms when a class in another discipline with higher enrollment requests that room. Out of 130 classrooms on campus, 106 are smart rooms and 124 have some technology, but language classes are often not assigned to the technology-equipped rooms, Robin said. University spokeswoman Maralee Csellar said in an email that to reserve classrooms, faculty submit requests to a “scheduling liaison” in the dean’s office who works with the registrar to meet those requests. When they cannot be met, the registrar will assign the class the “best room available” and try to accommodate needs in the best possible way, she said. Csellar declined to say how many language instructors are currently without rooms to teach courses. As of this week, at least three professors said they had not yet been assigned rooms. Professors whose classes are not assigned classrooms, or found that their classrooms don’t have the right technology, have resorted to claiming empty rooms they find around campus. Margaret Gonglewski, the director of the German language program, said she was assigned two different classrooms in 2020 K Street for her classes — one room for Mondays and Wednesdays and the other for Tuesdays and Thursdays — but switched those out for technology — equipped rooms. When she went to look at the room she had reserved in the K Street building, she found that it lacked technology and that it was under construction. She said she has had to hold in class in various rooms in Phillips Hall, with students never knowing where the class will be held until they arrive for class. She said one day she went to a classroom she had heard would be empty only to find it already occupied, and she had to hold class in the department’s lounge. “It feels like there is a lack of attention for the kind of infrastructure that we need to be teaching our classes decently, or even appropriately,” she said. She added that the problem is compounded by a lack of technology, which language classes use not only for textbook activities, but also for online teaching materials like websites or news sites in foreign languages. “That is just that is the way language learning is in the 21st century, and it is really tough when you don’t have those tools,” Gonglewski said. Alicia Suarez-Touzon, an instructor in the Spanish program, said that she has had to continually cancel her class on Mondays and Wednesdays because she only has an appropriate classroom space Fridays. She was also assigned a room in 2020 K Street but said the room was missing a projector, and the computer wasn’t functioning. When she cancels classes, students lose 50 minutes of Spanish instruction they would have had otherwise, Suarez-Touzon said. But without technology, she said she cannot teach the course appropriately. Instructors throughout the language department said that although the situation is especially problematic this semester, finding adequate classrooms has been an ongoing challenge. Maria de la Fuente, the director of the Spanish language program, said this is the first semester she has not been assigned a classroom and has taught in any empty room she can find. To remedy the problem, lecture halls could be divided into smaller, technology-capable classrooms, de la Fuente said. “And the lecture mode of teaching is kind of dissipating a little bit, and so as that happens, you need to accommodate the space to the new reality of teaching,” she said. Madeline Sklar, Janna Paramore and Mariana de la Maza contributed reporting.